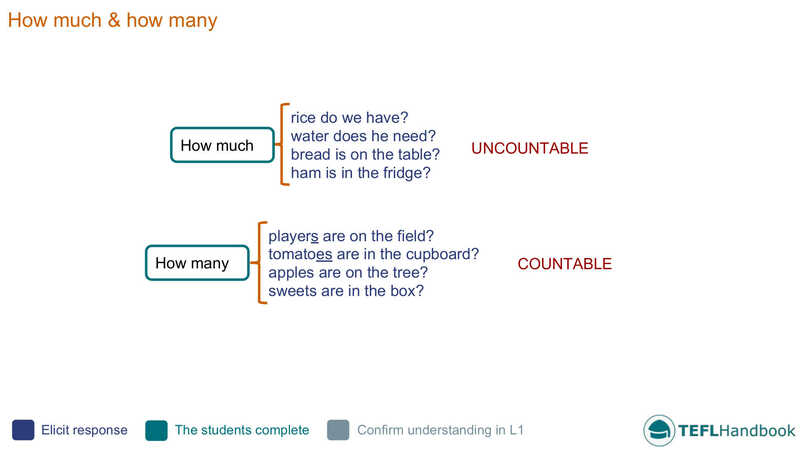 EFL - ESL activities and games: How much/many...? 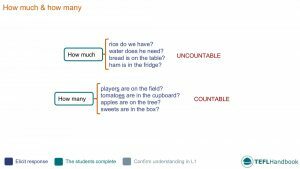 An A2 level ESL lesson plan on the usage of how much/many style questions. It includes a lead-in activity and several ideas for practical activities and games designed for low-resource classrooms. Feel free to use the activity ideas here to create or supplement your own lesson plan. And don't forget, if you use an iOS or Android device, you can get offline access to these materials through the TEFL Handbook app. The board work below gives one suggestion on how to introduce this topic to your class. Explain the rules for using each and elicit some common examples. 1. How much chocolate do you eat a week? 2. How many bars of chocolate do you eat a week? After you have reviewed their questions, the students will interview each other in groups of two or three. Monitor and correct any mistakes. Teacher: What was your first question? Student A: How many bars of chocolate do you eat a week? Teacher: And how many bars of chocolate does she eat? Student A: She eats three or four bars of chocolate a week. Contextually relevant games can be a great way of rounding off a successful lesson. Currently, we have one idea for a game that helps revise the topics covered in this lesson. We hope that you've found a few of these ideas useful. Our suggested next lesson is on the usage of a little and a few. Be sure to check out our complete list of elementary level ESL lesson plans, A2 lower and A2 upper, as well as our entire collection of ESL lesson plans. Also, if you are an iOS or Android user, this lesson plan is available for free on the TEFL Handbook app. An ESL lesson planner for English teachers.